A little while ago I was trying to find out what my alternatives were to using the conventional plastic handled toothbrush. I’d like to keep my teeth, so the brushing twice a day for the rest of my life is quite the long term plan. Now if I changed my toothbrush every 3 months as reccommended. Add in the odd change of toothbrush after illness. Times that for the next 60 years (I’m optimistic). That’s a lot of toothbrushes! Now there are a few alternatives out there on the market at the moment and I’m sure give it another few years and there should be a lot more readily available options to the average consumer. However for the most part, the average plastic toothbrush is what sells. Looking at a few of my options, I could get a 100% recycled plastic toothbrush, made from yoghurt tubs, (made in USA). I could use a twig from an appropriate tree, or I could use a bamboo handle toothbrush… Bamboo sounded good. Really well! The head is small enough to get in at the back teeth. The bristles are soft, works well on the gums and that little fella knows how to clean. To be honest I was slightly hesitant when I first saw it. How can something so basic looking work so well? However after giving it a go, I was left nodding to myself muttering that’s a good tooth brush, and with sparkly clean teeth to show for it. The toothbrush was designed by an Australian dentist. It’s biodegradable, environmentally sustainable. When you throw it out, it simply breaks down into compost. If you would like to give this toothbrush a red hot go, (not the one I was using obviously!) I’m giving one away. To get one for your pearly whites, tell me something about teeth or bamboo. Anything you like. An interesting fact about bamboo, or a story about your Nana’s false teeth, what ever takes your fancy…Post a comment by the 3rd of November…seriously, it’s a really good toothbrush. * Top photo from G magazine online. EDIT- Congratulations to Christine from Slow Living Essentials for getting the Bamboo toothbrush. This entry was posted in Going Green and tagged bamboo, biodegradable, cleaning teeth, dental care, environmentally friendly, family, green awards, landfill, sustainable living, The Environmental Toothbrush by cityhippyfarmgirl. Bookmark the permalink. That’s a great environmental option! I’ve never thought about what happens to plastic toothbrushes. We use electric ones, so we just change the little heads rather than the whole thing, but they still don’t break down. What are the bristles on these brushes made from? Please don’t enter us in your contest – our dentist has us all on electric brushes – but an interesting bamboo fact – did you know it’s the fastest growing plant in the world? They are a good environmental option aren’t they. Have a look at Joanna’s comment for what they are made of…and I wonder how fast they do actually grow? What a great idea! I have to admit, the little waste products like toothbrushes hadn’t occured to me – thanks for pointing it out! We use the electric ones, but when we travel I pack regular toothbrushes. I’m going to look for these! “In answer to your question the bristles are made of a biodegradable polymer namely a Nylon 4 Blend, please find below a scientific extract to explain the polymer. biodegradability of nylon 4 and nylon 6 blends was investigated in compost and activated sludge. The nylon 4 in the blend was completely degraded in 4 months while nylon 6 was not degraded . Recently, Yamano et al. was able to isolate polyamide 4 degrading microorganisms (ND-10 and ND-11) from activated sludge. The strains were identified as Pseudomonas sp. The supernatant from the culture broth of strain ND-11 degraded completely the emulsified nylon 4 in 24 h and produced γ-aminobutyric acid (GABA) as degradation product. I have never considered the impact of my toothbrush use on the wider world. I definately need one of these. My interesting tooth fact is that when I was pregnant with the twins I had to have three of my teeth removed (I kid you not). No anaethetic, no pain relief. Ouch! OH!…ow, gosh, ow….clenching my teeth together as I type. Brave woman. Bamboo is so great for wearing! I love the shirts and diapers- anv just discovered a wool/bamboo yarn for SOCKS! So here is my teeth story. My mom had false teeth. She wore her dentures for years- getting new ones when her mouth shrunk. Until she got cancer and figured she wasn’t going to live that much longer. Her mouth shrunk even more and she had to hold her teeth in when she talked. We couldn’t convince her to get them sized- so for the last 5 years of her life she had to hold her teeth in to say anything. My mom was a stubborn, thrifty and very brave woman. Bamboo wearing is wonderful isn’t it. Bamboo socks are antibacterial, so no more smelly feet- brilliant. Is the yarn expensive Heidi?… What percentage is it to wool? Thank you for sharing your story about your mom. 15% rayon from bamboo- 85% wool- the name is cute- ewe and bamboo. 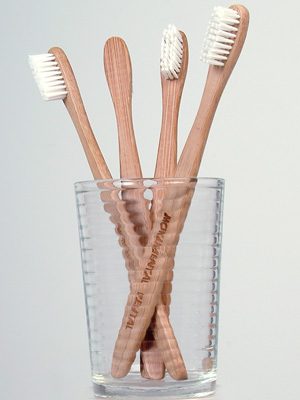 Cool idea…and good point about all those hundreds of toothbrushes sitting in landfill. I love bamboo fabric…so soft. Such a versatile plant….and all these years I just thought it was a pest! A pest with a purpose! Soft, soft, soft fabric isn’t it. Ooh – I’m going to go out and try to find one of these because I’m slowly trying to reduce plastic in my home. Is there no end to the uses of this wonder plant? We loved our bamboo nappies and my husband complains when our bamboo sheets have to be washed. I looked on the website and apparently toothbrushes for children will be available from November. I think we’ll be getting a box of each all going well. Fun Fact (that I just looked up): Bamboo produces up to 35% more oxygen than hardwood trees and absorbs four times as much carbon. Oooo bamboo sheets would be lovely. I’ll bet they are super soft. What a great invention…., so glad it was an Aussie dentist. And, yuk… all those dead un-decaying toothbrushes in landfill.., what a nasty picture. I’m so glad you’ve shared this …., I’m in for sure. Awesome – just an FYI, you do not need to change you Toothbrush every 3 months (nor your car oil), you need to change your toothbrush when it shows signs of wear (bent bristles). After illness or whenever you want a cleaner toothbrush place toothbrush head in a small glass jar (I like baby food jars) fill 3/4 with hot water, then top off with vinegar. The vinegar kills the germs. I use a spin brush (have had it for almost a decade, with replaceable heads, but the girls use PRESERVE toothbrushes – the ones from the yogurt tubs and more, preserve collects 3-7 palstics which are not readily recycleable in my and most areas and used those for its products, tooth brushes, razors, etc.) the head and litterally just the bristles and the smallest amount of plastic holding the bristles together gets replaced as needed. I do like the idea of Bamboo though…..
Just hate that consumerism drives recommendations for replacements. DH was a Manager for an Oil Change company and I questioned why he didn’t change our oil every 3 months, 3000 miles and he explained we don’t drive enough or hard enough to warrant every 3 months, 3000 miles. My last dentist asked me how often I replace my TB and I said probably 1x per year, she was aghast so the next time I went in I showed her my brush and she said as long as the bristles were in good shape so was I (besides she said I have great oral hygene). You are so right, and I should have clarified that about the bristles and when they need to be changed. When I looked at the Preserve website, I was pretty impressed with the look of the products. They are great aren’t they. I keep running my tongue over my teeth, thinking…this a good brush! We have been using our bamboo toothbrushes for about a year now! Dixie you were the one that first pointed them out to me! I think it was my first post I had read from your blog, and I loved the idea of the bamboo toothbrush…just forgot where I had read about them. Good to hear that you are still using them a year down the track. What a clever idea, I love it! Bamboo is such an amazing plant. Glad you’re enjoying your newfound brush in all it’s compostable glory. We use bamboo toothbrushes – they are from Monumental Dental. Next stop for them will be the compost bin. Sonya I’d be interested to see how long they take to break down for you. I did consider…for a second…to put them in my worm farm. However decided against that one. Oh how I’d love to have an ethical toothbrush – maybe I’d feel more motivated to keep my teeth clean?! As for thoughts about teeth or bamboo… hmmm. Apparently Napoleon was born with teeth. Ewww, his poor wet nurse. Also, you know how bamboo is supposed to be the indestructible plant? Well I managed to kill a pot of it dead. Quite a tragedy. How ever am I going to learn to grow vegies? You’ll be great with the veges. Wait until you get that bigger backyard and you’ll be away! Worm farm, and vege gardening here you come. Great giveaway. I’ve been thinking of trying them, but they look a little rough so was hesitant. I use an electric toothbrush as it means I only replace the small head. But taking into account the embodied energy that went into creating the brush in the first place its probably not a very green option, unless it lasts decades. re something about teeth or bamboo…. Bambo can be used to make lovely woven raised garden beds. Its my dream to one day weave a garden bed out of bamboo i’ve grown. Tricia I hadn’t thought of woven bamboo raised garden beds before. Just using my trusty friend google and some of the pictures look amazing. What an awesome idea. Regarding the toothbrush- not rough at all, and I’m picky with my toothbrushes. Well I haven’t come across biodegradable toothbrush (other than a twig or sage leaf), but we do use waste saving toothpaste. We use soap and a bar of soap lasts an awful long time – less expense, a lot less packaging and huge gains on healthy teeth. I’ve been using soap for 4 years now and my teeth have never been so good (touch wood). I’m intrigued! What sort of soap do you use? Update: Got a mixed box (4 medium, 4 soft, 4 kids) in the mail and they are great. No paddle pop stick feel at all. Excellent! Glad you are happy with them. I’ve been toting around bamboo sporks (tiny half spoon/half forks) in my purse for a while now and using them instead of disposable plastic–love them!! This looks great too. Thanks for the chance to win! I would love to try one of these toothbrushes, I am always on the lookout for anything that doesn’t create land fill. Where can one buy one or six from. I would like my grand children try them as well. My father would need one his toothbrush is missing so many bristles I don’t think half of his false teeth get cleaned, so hence he soaks them in bleach, they do look nice and white. I switched to bamboo toothbrushes after hearing Dr Jennifer Laver talk about her studies of the Leylani Albatross, and how they will be wiped out in our generation due to the chicks ingesting plastic from the ocean. Dr Laver measured up to 70% plastic in the bodies of dead chicks. Adults can regurgitate plastics, but the chicks don’t have the same reflex, and eventually die, either because their stomach is so full of plastic that it cannot accept food, or from poisoning from toxins leaching out of the plastics. The sight of a dead albatross chick with a toothbrush wedged in it’s throat still haunts me.